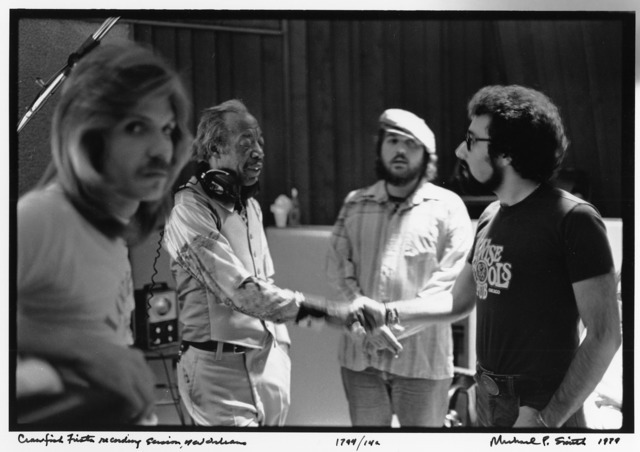 David Lee Watson, Professor Longhair, Dr. John, and Bruce Iglauer at Sea Saint Studios – Photo by Michael P. Smith. The success of Alligator is an inspiring tale, because blues, considered one of the great American music forms, once was called dead as a vital contemporary style — replaced by rock. But Alligator has proved that wrong, and in the process become one of the classic American blues labels. 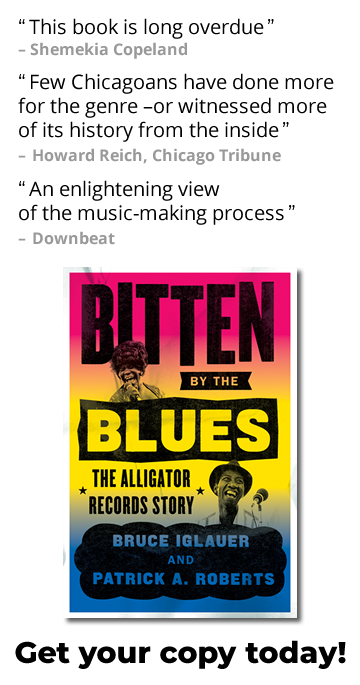 Raised in Cincinnati, Iglauer’s new book (co-written with Patrick A. Roberts) “Bitten by the Blues: The Alligator Records Story” was released this fall. As 2018 ends, “Best Recordings” judgments are being brought forth from all quarters — and Alligator Records is once again making its presence felt on Blues lists. For instance, Elvin Bishop’s Big Fun Trio is up for a Best Traditional Blues Album Grammy for Something Smells Funky ’Round Here. The Chicago-based Alligator, which was founded in 1971 by Cincinnati-raised Bruce Iglauer, gets a lot of credit for reenergizing Blues as vital, contemporary “genuine house rockin’ music,” to quote its motto. And now Iglauer, with co-writer Patrick A. Roberts, tells the story of how that happened in his new book Bitten by the Blues: The Alligator Records Story (The University of Chicago Press). The success of Alligator is an inspiring tale, because Blues, considered one of the great American music forms, once was called dead as a vital contemporary style — replaced by Rock. But Alligator has proved that wrong, and in the process become one of the classic American Blues labels. It has released some 330 titles featuring more than 100 artists to date, as its definition of Blues evolves and broadens with time. Besides Bishop’s Grammy-nominated album, its other more heralded 2018 releases include America’s Child by Shemekia Copeland; Journeys to the Heart of the Blues by Joe Louis Walker, Bruce Katz and Giles Robson; The High Cost of Low Living from the Nick Moss Band featuring and Dennis Gruenling; and Rough Cut by Curtis Salgado and Alan Hager. …But living here did afford Iglauer a chance to explore and discover music outside the Pop and Rock mainstream. In 1965, using his high-school newspaper press pass, he saw John Coltrane perform at the Ohio Valley Jazz Festival at the old Crosley Field. “Looking back, I realize his performance had all the raw passion that I later discovered in the Blues,” he writes in Bitten by the Blues. Attending Lawrence University in Appleton, Wisconsin, Iglauer got interested enough in Blues to arrange a concert for his school’s homecoming with Howlin’ Wolf, a powerful and influential Chicago bluesman who recorded for that city’s Chess label. And on his own, he subsequently promoted a show by Blues guitarist Luther Allison. Iglauer started coming to Chicago and befriended (and eventually worked for) Bob Koester, who operated the small Jazz and Blues label Delmark Records as well as the Jazz Record Mart. With Koester as a guide, he started attending African-American clubs on the South Side and West Side. By Steve Rosen. Read his full “Alligator Records’ Bruce Iglauer has the blues –and that’s a good thing” story at CityBeat.